James Dennis Alan "Denny" Hamlin (born November 18, 1980) is an American professional stock car racing driver. He currently competes full-time in the Monster Energy NASCAR Cup Series, driving the No. 11 Toyota Camry for Joe Gibbs Racing and part-time in the NASCAR Xfinity Series, driving the No. 18 Toyota Supra for JGR. He has won over 30 NASCAR Cup Series races, including the Daytona 500 in 2016 and 2019. Hamlin was born in Tampa, Florida, but lived in Chesterfield, Virginia, for most of his childhood. He was born the youngest of five children. He began racing go-karts at the age of seven. Afterward, he worked his way up to Late Models by 2004 and signed a development contract with Joe Gibbs Racing. After running briefly in the Craftsman Truck Series, Hamlin drove a full season in the Busch Series in 2005, while running a few Nextel Cup races. After having strong race finishes, Hamlin was given a full-time ride with JGR. His strongest season was in 2010, where he was leading the Championship by 15 points heading into the final race at Homestead. Despite having an incredible season, winning the most races of any driver in that year (8), he would lose the Championship by 39 points to Jimmie Johnson. With the exception of the 2013 season, in which a collision with Joey Logano damaged his lower back and kept him out for a large part of the early season, Hamlin has competed in the NASCAR Cup Series Playoffs in every season he has competed full-time (12 seasons as of 2018), including his rookie season in 2006 when he finished third in the Chase for the NASCAR Nextel Cup standings, capping off one of the most impressive rookie campaigns in modern NASCAR history. Since his appearance in the Cup Series, Hamlin has been one of the most consistent drivers in the sport, winning at least one race from the 2006 to 2017 Cup seasons and again in 2019. Hamlin began his racing career in 1988, at the age of 7 years old, racing go-karts. By 1997 at 15, he won the WKA manufacturers cup. At the age of 16, he was racing Ministocks. In his first stock car race, at Langley Speedway, Hamlin won the pole position, and won the race. He then progressed to the Grand Stock division in 1998, and moved on to Late Model Stock Cars in 2000. In 2002, he won ten Late Model races, and surpassed that in 2003 with 25 wins, and 30 poles, out of 36 races. In 2004, while competing full-time in Late Model Stock Cars, Hamlin was signed to a driver development contract with Joe Gibbs Racing. In 2004, Hamlin competed in five NASCAR Craftsman Truck Series (now called the Gander Outdoors Truck Series) races with EJP Racing, and had a tenth-place finish in his NASCAR debut at Indianapolis Raceway Park. He later ran his first career ARCA RE/MAX Series race at Talladega Superspeedway, finishing third in the No. 10 Pontiac owned by Andy Hillenburg. His final start of the year came at Darlington Raceway, when he made his Busch Series (now called the Xfinity Series) debut. He started twenty-seventh (rain-out) but finished eighth in the No. 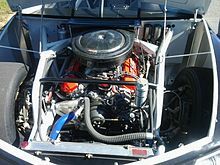 18 Joe Gibbs Driven Performance Oil Chevrolet. Hamlin ran the full season in 2005 after he replaced Mike Bliss in the No. 20 Rockwell Automation Chevrolet in the Busch Series. He ended up finishing 5th in the final championship points standings as a rookie in that series, with 11 top 10s and earnings of $1,064,110. Hamlin also ran his first NASCAR Cup Series races in 2005, making his Cup debut at Kansas Speedway as driver of the No. 11 FedEx Chevrolet for the 2006 season, after Jason Leffler was released, and made seven starts in the Cup series in 2005. He finished the Cup season with three top 10 finishes in those seven starts and one pole at Phoenix International Raceway. His performance in 2005 was impressive, a stark contrast to Leffler's embarrassingly poor performance during his tenure in the same car earlier in the season. In 2006, Hamlin ran his first full season in the NASCAR Nextel Cup Series (now called the Monster Energy NASCAR Cup Series), and during the year he drove in both the Nextel Cup and Busch Series full-time. In Hamlin's first restrictor plate race as a Nextel Cup driver, he beat all the previous year's (2005 season) pole winners in the 70-lap 2006 Budweiser Shootout. Hamlin became the first Rookie of the Year candidate to take home the Shootout victory. Hamlin achieved his first career Busch Series victory at Autodromo Hermanos Rodriguez (March 5). On June 11, Hamlin scored his first career Cup Series win at the Pocono 500, where he also won his second career pole. He achieved his second career win on July 23, in the Pennsylvania 500 also at Pocono Raceway becoming only the 2nd rookie in Nextel Cup history to sweep both races at a track during the same season (Jimmie Johnson did so at Dover International Speedway in his rookie season in 2002), both from the pole position. In the Cup Series, Hamlin won the Raybestos Rookie of the Year award and finished third in the final Cup standings, scoring the highest points finish for a rookie in the modern era of NASCAR, and the highest since James Hylton in 1966. Hamlin thus became the first ever rookie to make the Chase for the NEXTEL Cup, which he finished third in points. Hamlin started the 2007 Cup season by finishing 28th in the Daytona 500. He won his third career Cup race at the Lenox Industrial Tools 300 at New Hampshire International Speedway. Following that race, Hamlin finished 43rd in the Pepsi 400 at Daytona International Speedway after being involved in a wreck early on in the event. This was the first ever 43rd-place finish in his career. Hamlin clinched a spot in the Chase for the Cup and was seeded sixth, 50 points behind the leader, but finished 12th overall in the final standings. In the Nationwide Series, Hamlin scored three victories including Darlington, Michigan, and Dover in the No. 20 Rockwell Automation Chevy. He also finished 1st at Milwaukee, but Aric Almirola started the car and ran 60 laps before turning it over to Denny Hamlin. Almirola received the points, purse, and got credit for the win. In 2008, Hamlin had a near identical season as before, but moved up to eighth in points, and won early in the season at Martinsville Speedway. He led 381 out of 410 laps in the 2008 Crown Royal Presents the Dan Lowry 400, the most dominant effort of a driver since 2000, but cut a tire and finished 24th. He won four races in the Nationwide Series, driving both the No. 18 and No. 20 entries for Gibbs, as well as the No. 32 Dollar General/Hass avocados car for Braun Racing. He continued driving the No. 11 car in Sprint Cup in 2009, as well as sharing the No. 20 car for Joe Gibbs Racing in the Nationwide Series. Hamlin won his fifth Cup career race at Pocono Raceway on August 3, 2009. Hamlin boldly stated at the final restart "I'm going to win this race." He followed through on the statement, moving from sixth to first and snapping a 50 race win-less streak. The win was Hamlin's third at Pocono. It was especially emotional for the No. 11 team as Hamlin had lost his grandmother, Thelma Clark, that Friday. Hamlin once again dominated the race at Richmond International Raceway and finally won at his home track. On October 25, 2009, Hamlin held off Jimmie Johnson to win the TUMS Fast Relief 500 at Martinsville Speedway. He went on to win the Ford 400 at the 2009 NASCAR Sprint Cup Series Finale at Homestead-Miami Speedway, capping off his 2009 season 5th in the overall standings with 4 wins, 15 top 5s and 20 top 10s. Hamlin took the lead after starting the race in 38th position and he led a total of 70 laps to capture his 4th win of the 2009 season. Hamlin entered the 2010 season with great expectations. Many[who?] believed he would be a favorite to unseat Jimmie Johnson as Sprint Cup Champion. On January 22, 2010, Hamlin tore the anterior cruciate ligament in his left knee while playing basketball. The decision was made to postpone his surgery until after the season. Hamlin announced on March 27, 2010, to have surgery on his left knee the following Monday. The decision was made to prevent further damage to his knee. On March 29, 2010, Hamlin won the rain-postponed race at Martinsville Speedway in wild fashion. He beat his Joe Gibbs Racing teammate, Joey Logano, and Jeff Gordon to the finish line. Two days later, Hamlin had knee surgery to repair the torn ligament in his left knee. On April 19, 2010, three weeks after his surgery, Hamlin worked his way from a 28th starting spot to restart 2nd with 13 laps to go at Texas Motor Speedway. Hamlin was later able to pass Jeff Burton on the outside and hold off Jimmie Johnson to get his 10th career win and his second win in three races. Less than three weeks later on May 8, Hamlin visited victory lane for the third time in 2010 at Darlington Raceway. He swept the weekend by winning both the Sprint Cup and Nationwide series events. He became the first driver to do so at Darlington since Mark Martin in 1993. He won the Nationwide Series Royal Purple 200 presented by O'Reilly Auto Parts driving the No. 20 for Joe Gibbs Racing on Friday night. He started on the pole and led the most laps to win the race. Hamlin started 8th in Saturday night's Showtime Southern 500 and went on to lead 108 laps and take the checkered flag. A few races later, Hamlin dominated at The Gillette Fusion ProGlide 500 Presented By Target at Pocono Raceway, leading the most laps on his way to gathering his 12th career win, his 4th win of the season, and his fourth win at Pocono. A week later, Hamlin set a career-high fifth win of the season, when he won at Michigan International Speedway after starting 7th. Later in the 2010 season, Hamlin finished 43rd in the Emory Healthcare 500 at Atlanta Motor Speedway. This dropped him five spots in the Chase standings, placing him in 10th overall. Despite the drop in the standings, the top 10 drivers in the Chase were locked in after Atlanta, guaranteeing Hamlin a spot in the 2010 Chase for the Sprint Cup. A driver error in the first Chase race on part of Carl Edwards caused Hamlin to spin with 85 to go. With cars ahead running out of fuel, Hamlin barely lost to Clint Bowyer. In the AAA 400 at Dover International Speedway Hamlin finished the race in 9th and retained the points lead by 35 points over Jimmie Johnson. The following week at Kansas Speedway, Hamlin encountered a rough driving car and finished 12th, a finish that was not good enough to keep the points lead, and fell into a deficit of 8 points to Jimmie Johnson, who finished 2nd. Then the following week at California he finished in the top 10 but still lost points to the 48 car of Jimmie Johnson. At Charlotte Motor Speedway, Hamlin led a lap (his first lead in the Chase) and finished in 4th, one spot behind points leader Jimmie Johnson, and lost another 5 points. But the triumph came at the .526-mile (paper clip-shaped) Martinsville Speedway; Hamlin came through with his series-leading seventh victory of the season. Hamlin won the pole and led the first 11 laps but encountered tire issues; he dropped back to 17th and finally worked himself up consistently to 5th until lap 471 with 29 laps to go, he took the lead from Kevin Harvick and held off a hard-charging Mark Martin to lead the final 29 laps and take his 3rd straight victory at Martinsville and his 4th at the historic track. He closed the lead to 6 points behind points leader and 5th-place finisher, Jimmie Johnson. Next up was the Amp Energy Juice 500 at the Talladega Superspeedway. Hamlin started 17th, but fell back and lost the draft. He went a lap down, but when a caution came out, he got the Lucky Dog and was back on the lead lap. He then worked his way up to a 9th-place finish, two spots behind points leader Jimmie Johnson. This put Hamlin another 8 points behind in the standings, totaling to 14. Hamlin won the AAA Texas 500 at Texas Motor Speedway, and then led the standings by 33 over Johnson with two races to go. Next was Phoenix International speedway. Hamlin started 14th but got up to the front right away and was leading for almost the whole race. With 14 laps to go, Hamlin had to pit because he was short on fuel. He finished 12th. After the race, Hamlin was furious and threw a water bottle in frustration. With one race to go, Hamlin led Johnson by 15 points and was 46 points ahead of Kevin Harvick. On the last race he lost the lead to Johnson and ended up 39 points behind him. In 2011 Hamlin almost won the Budweiser Shootout, but the victory was taken away from him by Kurt Busch because at the last second, Hamlin crossed the yellow line, on turn four to the finish line, in his attempt to pass Ryan Newman. Denny struggled in the first 8 races where his only top 10 was a seventh at Las Vegas. However, when the series got to Richmond, Denny turned on the heat by winning both his charity event and the Nationwide race but would finish 2nd to teammate Kyle Busch. He would go on to finish outside of the top 10 once at dover finishing in the top 20 and rebounded with finishes of 10th and 3rd at Charlotte and Kansas respectively. After his 3rd-place finish at Kansas, he would climb to 11th in points – 1 point out of the coveted 10th as the series goes to his favorite track, Pocono, where he would have tied himself for the most all-time wins at the track, if he had placed first. After a disappointing 19th-place finish, he moved on to Michigan, a track at which he posted a 1st and 2nd-place finish in 2010. Before the first practice at Michigan, oil pans unapproved by NASCAR were confiscated from the three JGR teams, including Hamlin. After showing signs of sheer mediocrity during each practice and qualifying, Hamlin qualified 10th in the field. He showed signs of improvement at the very start of the race, Hamlin quickly slid back in the field and was in the 10th to 15th place range until beginning to improve with about 70 laps to go, deeming the adjustment on his loose race car "a magic adjustment" On lap 158, with 42 laps to go, a penalty caused by an accident between Juan Pablo Montoya and Andy Lally allowed Hamlin to move to the front of the field by short pitting. Another caution on lap 192 moved the 11 car up to the first position. After a restart, Hamlin surged to ahead of the group, with Matt Kenseth right behind him in the closing three laps. After desperately trying to move past Hamlin, Kenseth made a final attempt coming out of turn four on the final lap, causing him to almost hit the wall because of a loose racecar. This win vaulted Hamlin from 12th in the standings, where he would have been replaced in the chase by Jeff Gordon if each stayed in their current position, to 9th, where he is guaranteed a spot in the chase. At the end of the season Joe Gibbs Racing announced that Mike Ford would not return as Hamlin's crew chief in 2012. Joe Gibbs Racing announced that Darian Grubb will be Mike Ford's replacement as Hamlin's crew chief for the 2012 season. Grubb previously served as crew chief for Tony Stewart, where he helped Stewart to his third Sprint Cup title in 2011. Hamlin scored his first win of the year in the second event on the schedule, at Phoenix International Raceway. On April 22, Hamlin out-dueled Martin Truex Jr. to score his second win in the eighth race of the year, at Kansas Speedway. At the Crown Royal Curtiss Shaver 400 at the Brickyard, Hamlin scored his eleventh pole. He won his third race of the year at Bristol Motor Speedway on August 26 in the Irwin Tools Night Race. A week later, he became the first driver of the year to have back-to-back wins, winning the AdvoCare 500 at Atlanta Motor Speedway, again out-dueling Truex. Two weeks later, he dominated and won the Sylvania 300 at New Hampshire Motor Speedway after starting 32nd, deep in the field. This was Joe Gibbs Racing's 100th win in the NASCAR Sprint Cup series. Hamlin started the season on a low note, crashing his cars in both the Sprint Unlimited and the Budweiser Duel. The crash in the Duel put him into a backup car for the Daytona 500. Hamlin started 35th, led 33 laps, and finished 14th. He improved the following week, with a third-place finish at Phoenix, then a 15th-place finish at Las Vegas. He led the most laps at Bristol, but ran out of gas. Controversy unfolded after Hamlin spun his ex-teammate Joey Logano battling for position. This resulted in Hamlin and Logano exchanging words in the garage after the race. At Fontana, Hamlin won his first pole for 2013. On the final restart Hamlin restarted in 12th place and with 12 laps left Hamlin reached third place before passing Kyle Busch and Kurt Busch for the top 2 spots with Joey Logano. His rivalry with Logano continued as the two fought side-by-side for the win in the last two laps. Heading into turn 3 on the white flag lap, Hamlin edged in front at the entry, but Logano drifted up the track into Hamlin. In his attempt to correct the car, Hamlin tagged Logano, sending the latter up into the outside wall, while Hamlin came off the banking and smashed head-on into an inside retaining wall. Hamlin's teammate Kyle Busch passed them to win the race. Although Hamlin climbed out of the car right after the crash, he immediately collapsed and lay on the track. He was airlifted to the hospital as a precaution. When lying in the hospital Hamlin interpreted Logano's post race words about their battle as Logano saying that he held a grudge against Hamlin and retaliated against Hamlin. It was announced the next day that Hamlin had suffered a massive L1 compression fracture, or a collapsed vertebra. Dr. Petty, Hamlin's JGR doctor reported on Tuesday that Hamlin's back would heal in six weeks and Hamlin would need time off. Two of Michael Waltrip Racing's Part-time drivers stepped in to replace Hamlin, with Mark Martin filling in at Martinsville and Brian Vickers filling in for four races. He made his return at Talladega in the Aaron's 499, and told reporters that since he was not ready to run a full race, he would switch with Brian Vickers during the first caution and pit stop by a special exit on the roof attached to the car. Like planned, during a caution, Hamlin switched out with Vickers on lap 23. Under NASCAR rules, since Hamlin started the race, he would receive credit for any results. Vickers got caught up in a 14 car wreck on lap 43, relegating the car to a 34th-place finish. At Darlington, Hamlin drove his first full race since his injury. He qualified sixth. In the waning laps, he held off Jeff Gordon to finish second to teammate Matt Kenseth. At Charlotte, for the Coca-Cola 600, Hamlin clinched a pole position with a record speed of 195.624 miles per hour (314.826 km/h), breaking the previous speed of 193.708 miles per hour (311.743 km/h) set by Greg Biffle. During the race, Hamlin led six laps and finished in the fourth position. At Dover, Hamlin started on the pole for the second week in a row. He led 41 laps before he cut a tire on lap 378 and hit the wall, causing him to finish 34th. At Pocono Hamlin started in 17th and finished in 8th place. He had shown some recovery. At Michigan, Sonoma and Kentucky, Hamlin did not fare well. Finishing in 30th, 23rd and 35th place. He only got up to 25th in the points standings and 150 points behind 20th place. Without any wins, his chances of making a Wildcard bid for the Chase were nixed. At Daytona, Hamlin started 24th and led 20 laps, before he got into a wreck off of turn 4 with Juan Pablo Montoya and Martin Truex Jr.. Hamlin stayed on the track, a lap down, and got the free pass with the next caution. However, on lap 148, Hamlin hit the tri-oval wall head on and then his car was struck by A. J. Allmendinger and went airborne. He wrecked at Pocono on Lap 15 after losing control of his car in the third turn and solidified his chances of missing the Chase for the first time in his career (He ran 7 races in 2005 but his first appearance was at a Chase race). At Michigan, he was officially eliminated from the Chase even if he won the next four races because he was too far back in the points. At Richmond Denny Hamlin got an apology from Joey Logano for their Auto Club incident with Logano after months of denial admitting it was on purpose but Hamlin did not buy the apology, thinking that Logano was just doing it to ask Hamlin to not interfere with his own title hopes. Despite this Hamlin and Logano said they settled their differences by December. Though Hamlin struggled to a 23rd-place points finish, the season was not entirely unkind to him, as he won the season finale at Homestead after a fierce battle with Matt Kenseth and Dale Earnhardt, Jr. over the last 30 laps. Hamlin started the 2014 season strong by winning the pole and leading all three segments of the Sprint Unlimited, eventually winning the race. Hamlin then went on to win the second of the Budweiser Duels. In the Daytona 500, Hamlin started third and led for 16 laps, and was the fan favorite to win the race and sweep all three Sprint Cup events in Speedweeks, but was unable to overtake Dale Earnhardt, Jr. in the last two laps and ended up finishing second. At Auto Club, Hamlin came down with a sinus infection that affected his vision just hours before the race began. A half-hour before the green flag, Joe Gibbs Racing managed to place Sam Hornish, Jr. to take over Hamlin's car for the race. Hornish drove the car to a 17th-place finish. The infection was announced a few days later as a piece of metal that had been lodged in Hamlin's eye. At Talladega, Hamlin won the race as the caution flag waved during the last lap. At the Brickyard 400, Hamlin finished 3rd. However his 11 car failed post-race inspection. NASCAR impounded the 11 car and investigated various pieces on it. 2 days later NASCAR suspended crew chief Darian Grubb for six races, fined Grubb $125,000, docked Hamlin 75 driver points and Joe Gibbs 75 owner points, suspended 11 car chief Wesley Sherrill and put the 11 team members on probation until December 31, 2014. Initially Joe Gibbs and the team decided to appeal the penalties but they changed their minds. On the penalty Denny said "We'll just simply move forward and not let this affect our performances." Despite the penalties handed to Hamlin's crew, Denny Hamlin is locked into in the 2014 Chase due to his win at Talladega Superspeedway. Hamlin's spot in the 2014 Chase was sealed up after the 2014 Michigan race with his Talladega win. At Bristol, Hamlin appeared to have a perfect car to win but after leading many laps Hamlin wrecked after contact from Kevin Harvick while racing for the lead. Hamlin replied by angrily throwing his HANS device at Harvick's car during a caution period. Some fans wondered if NASCAR should have penalized Hamlin for exiting his car before the safety workers came out (a rule made by NASCAR in the wake of the big tragedy in which Tony Stewart's car ran over and killed Sprint-Car driver Kevin Ward Jr.) but NASCAR did not penalize Hamlin, stating that safety workers first had told Hamlin to get out of the car by radio & then gave Hamlin permission to toss his HANS device at Harvick's car. Harvick later apologized for causing the crash via Twitter while Hamlin said his acceptance of Harvick's apology would only depend on how clean Harvick would compete with him in the future. Despite he and his team's shortcomings throughout the regular season, Hamlin managed to put together a consistent Chase. His results earned him a spot within the final four title contenders heading to the final round, and he was leading the race and the title with twenty laps to go, but a caution came out and Darian Grubb, his crew chief, decided to opt out of stopping for fresh tires and fuel, which would turn out to be a costly decision. He finished 7th in the race, and 3rd in the championship. Hamlin led with 11 laps remaining in the 2015 Daytona 500. Hamlin started the season by having to go to the rear in the Budweiser Duels after being penalized during Daytona 500 qualifying. In the Daytona 500 he came very close for the second year in a row to winning the race. He finished 4th and had one of the best cars of Speedweeks. However, at Atlanta, Hamlin finished 38th after being involved in a wreck with 42 laps to go. In Las Vegas, he rebounded from his wreck the previous week and finished 5th. However, at Phoenix, Hamlin did not run well all day leading to a 24th-place finish. At California, Hamlin had one of the best cars of the race, leading 56 laps, second to Kurt Busch's 61 laps. A bad pit stop and bad ensuing restart pushed Hamlin down to 13th, but he rebounded to 3rd place with 20 laps to go. Hamlin's chances of winning the race ended when he and his crew were penalized for an uncontrolled tire on their pit stop with 20 laps to go making him go to the tail end of the longest line. He restarted 29th and finished the race 28th. At Martinsville Speedway, Hamlin stayed up in the top ten nearly all race long. Late in the race he got penalized for an uncontrolled tire, sending him to the tail end of the field in 31st place. Despite this he formed a tremendous comeback, coming back into the top ten 50 laps later. After a good restart with less than 30 laps to go, Denny Hamlin sealed up his victory, but not before holding off a challenge by rival Brad Keselowski. Hamlin edged Keselowski at the stripe by 0.3 seconds (1 car-length), for his 5th Martinsville victory, leading 91 laps in total. Hamlin, who had feuded with Keselowski during the 2014 Bank of America 500, commended Keselowski for not wrecking him to win the race. At the spring Bristol race, Hamlin was replaced by Erik Jones after 22 laps due to suffering from neck spasms. In May, Hamlin won the Sprint All-Star Race after beating Keselowski off pit road during final pit stops. This was not only Hamlin's first All-Star win, but also the first JGR and Toyota All-Star wins. After qualifying for the Chase for the NASCAR Sprint Cup, Hamlin won the first race of the Chase at Chicagoland Speedway, which locked him in for the second round of the Chase. At Talladega in the next round, at the end of the race his car crashed and caught fire because of being caught up in "The Big One", which eliminated him from the Chase for not having enough points to advance. With new crew chief Mike Wheeler replacing Dave Rogers, Hamlin won the Sprint Unlimited. In the Daytona 500, Hamlin made a pass on Joe Gibbs Racing teammate Matt Kenseth for the lead on the final lap. Hamlin and Martin Truex Jr. were side-by-side for the win as they crossed the start-finish line, but Hamlin – who led a race-high 95 laps – prevailed by 0.011 seconds over Truex, making it the closest Daytona 500 finish in history, and bringing owner Joe Gibbs his first Daytona 500 victory since 1993. After his huge Daytona 500 win he struggled a bit, the next week at Atlanta he wasn't as strong finishing 16th. The next week at Las Vegas he would finish outside of the top 10 again finishing 19th. The next week at Phoenix he would rebound with a strong 3rd-place finish. The next week at Auto Club he would have another strong 3rd-place finish. The next week at Martinsville he was running well till he wrecked after jumping the curb and slamming into the wall and he would finish 39th. The next week at Texas he would finish 12th. The next week at Bristol he would wreck again finishing 20th. The next week at Richmond he would get a solid top 10 finish finishing 6th. The next week at Talladega he would be involved in a wreck yet again finishing 31st. The next week at Kansas he would be involved in back to back wrecks finishing 37th. The next week at Dover was involved in a wreck 3 weeks in a row after there was a botched restart when Jimmie Johnson missed a shift, but would bounce back to finish 7th. At the next weekend in Charlotte, Hamlin ran double duty, driving car number 18 to the win, the 15th Xfinity Series race of his career in his first Xfinity start of the season. In the Cup race, he would run great all race long and would finish with a solid 4th-place finish, while his Toyota teammate Martin Truex Jr. would dominate the race and win. The next week at Pocono he would finish get a solid top 15 finishing 14th. The next week at Michigan, he cut his left-rear tire at the start-finish line, resulting in a disappointing 33rd. The next week at Sonoma, Hamlin would lead the most laps but Tony Stewart would get the lead later after staying out and on the final lap Hamlin would pass Stewart but in the final corner Hamlin would wheel hop and hit the wall giving Stewart back the lead and Stewart would go on to win and get his first win since 2013. The next week coming back to Daytona, Hamlin would finish 17th. The next week at Kentucky, it would come down to fuel and Hamlin would finish 15th. The next week at New Hampshire, he would finish 9th. The next week at Indy, he would finish 4th. The next week at Pocono, he would finish 7th. The next week at Watkins Glen, Hamlin would run well and get the lead later in the race and after a couple of red flags, he would go on to win getting his 2nd win of the season since the Daytona 500. The next week at Bristol he would finish 3rd after a couple of big wrecks at the end. The next week at Michigan, he would finish 9th. Hamlin would pick up his third win of the season at Richmond in September. Hamlin had a difficult start to the 2017 season, in which there were many changes to how the races are run (the biggest change being the all-new stage racing). Hamlin picked up an 8th-place finish in Stage 1 of the Daytona 500 but got caught up in one of several 'Big Ones' at the end of Stage 2, caused by a tire blowout on the No. 18 Toyota Camry of Kyle Busch, and would finish the race in 17th. A dismal race in Atlanta followed, with Hamlin retiring from mechanical failures, and he was classified 38th. However, he bounced back in Las Vegas with a sixth-place finish, and followed this up with another top-10 result in Phoenix. In the STP 500 at Martinsville, a track on which Hamlin is a 5-time winner, he claimed 2nd place in Stage 1, before suffering from firstly a bad pit strategy and then a collision with Danica Patrick, finishing 30th in the race. Hamlin's Toyota began to improve dramatically after a mediocre Texas race and, through combining the new-found speed of his JGR car and his limitless talent on short tracks, earned two 8th-place finishes in stages 1 and 2 at Bristol and led a dozen or so laps of the race late on, but was passed by Jimmie Johnson in the final stage and subsequently fell back to finish 10th. He also led 50 laps at his home track at Richmond (also a short track), superbly jumping Brad Keselowski from 2nd place at the 6th restart, and would earn a 3rd-place finish in the race, along with stage points from both stages. Hamlin's unique skills on restrictor-plate tracks shone through at Talladega Superspeedway the following week. He used pit strategy to take his first stage win of the year in stage 2, and also led more laps than any other driver, but this wasn't enough to get his first win, as he fell back late in the race. He took his second stage win of the year in Stage 3 of the Coca-Cola 600 in Charlotte and led the last 10 laps of that stage. However, Hamlin restarted poorly from the front and fell back to 10th on the first lap of the final stage. He would recover and work his way through the field, finishing 5th and earning valuable points in the standings. Hamlin earned a respectable 8th-place finish at a wreck-filled Dover despite getting busted for an uncontrolled tire in Stage 1, and subsequently ran well at Pocono, finishing 12th after falling back late. At Michigan, Hamlin finished 4th after a tense battle with Kyle Larson on the final restart. He then returned to the road course at Sonoma, the scene of his duel with Tony Stewart in 2016 where he was passed on the last corner of the last lap. He led 12 laps during Stage 2 and remained in the top 2 throughout most of the race but he lost grip in his tires towards the end, losing 2nd to Clint Bowyer with 6 laps to go and then 3rd to Brad Keselowski on the final lap, just before the caution waved to end the race after Kasey Kahne crashed on the front straight. He finished 4th, adding to his 5th and 4th places in the two stages earlier in the race. At Daytona the following week, Hamlin had a very quick car, leading 16 laps during Stage 2 and finishing a very close 2nd to teammate Matt Kenseth in that stage. However, Hamlin's Coke Zero 400 race on the 4th of July weekend ended in frustration as he suffered only his second retirement of the year. Hamlin got caught up in a 3-car incident with 3 laps to go, while running 7th. He tried to get moving again before the car erupted into flames, ending his evening. The next race in Kentucky brought another consistent top-5 weekend, finishing 4th and 5th in the stages and 4th overall, but it was the following week that Hamlin finally broke through. He came from 8th on the grid - finishing every stage in the top 10 (9th and 2nd) to then lead 52 laps on his way to victory in New Hampshire. This win marked Hamlin's 30th NASCAR Cup Series win, his 3rd career Cup victory at Loudon and JGR's first win of 2017. A dismal Indianapolis race followed, with a 17th-place finish after a blown tire in overtime cost him a top-5 result. However, Hamlin got back into the top 5 yet again this season at the Overton's 400 in Pocono. The race became all about 4 drivers, as he battled with Kyle Busch, Martin Truex Jr. and Kevin Harvick throughout. Hamlin would end up finishing 4th after leading 18 laps and looking like a real contender to win his second race of the season. Busch went to victory lane, ensuring everyone that JGR were back up to their regular speed. Hamlin continued adding to his impressive amount of top-5 finishes for 2017 the following week, finishing 4th at Watkins Glen, the scene of his first road course victory of his career the year before. Heading into the next race at Michigan, Hamlin's long-time partner Jordan Fish had reached the end of her pregnancy, and their baby was due at any point. Due to this, NASCAR Camping World Truck Series driver Christopher Bell ran laps in Hamlin's No. 11 Toyota in practice as preparation to step into the car, in the event that Hamlin's girlfriend would go into labor during the weekend. She did not, however, as Hamlin finished the race in 16th due to a bold strategy by the team to stay out on old tires until a caution flew, which did not happen as planned; he pitted just 11 laps from the end, and the caution he needed flew 2 laps later. Hamlin earned himself a 3rd-place finish at the Night Race at Bristol after a very consistent run. The following week, at Darlington, Hamlin dominated both the Xfinity and Cup races. He outdueled Joey Logano in the Xfinity race on Saturday, using the crossover move on the last corner to cut underneath him and win. In the Cup race, Hamlin's 'Flying 11' was the most consistent and fastest car on track. After leading 124 laps out of the 367 lap event, he drove on to victory and would get his 2nd win of the season despite a pit road mistake late in the race. However, his car would fail post-race inspection in both races after NASCAR discovered an illegal rear suspension element. Hamlin's wins would be ruled "encumbered" and he was docked 25 points as a result. His crew chief Mike Wheeler was fined $50,000 and suspended for 2 races. The Cup Series event would also mark Hamlin's most recent victory up until the 2019 Daytona 500, 47 Cup races later. The final race of the regular season at Richmond provided yet another top 5 for the No. 11 car, but it could have been better. Kyle Larson won the race after besting Martin Truex Jr. in overtime, but on the final lap Hamlin attempted to pass Truex for 2nd and slid his tyres, collecting Truex and putting him into the outside wall. Hamlin recovered to finish 5th and later apologised to the 2017 regular season champion. The playoffs began very well for Hamlin as he added another top 5 to his amazingly consistent run of late, finishing 4th. This meant that his average finish of 6th over the last 10 races was the best in the field, and put him in an excellent spot going into the 2nd playoff race at New Hampshire, a race that Hamlin won in the summer and has won 3 times overall in his career. Despite his summer win at Loudon, he would finish 12th this time after a pretty average race. At Dover, Hamlin was able to collect stage points to clinch a spot for the Round of 12, but retired from the race with less than 30 to go due to a broken axle. The Round of 12 began very positively for Hamlin, as he clinched the pole for the Bank of America 500 at Charlotte race, his first pole of the season. He ran up front the entire race, earning useful stage points and eventually a 4th-place finish, which placed him 5th in the standings, 13 points above the cutoff line going into Talladega. Hamlin started the round of 8 in a controversial Martinsville race, where at 3 laps to go, he bumped Chase Elliott on one of the turns, causing Elliott to spin out. Many fans believed that the wreck was done intentional, as they booed loudly at Hamlin during his post-race interview. “I got into the back of him and he spun out,” Hamlin told NBCSN. “Trying to get a race win. … Everybody was doing the exact same thing. I hate it for his team. I understand they’ve had a win for a long time coming, but this is for a ticket to Homestead. ” At Phoenix, on what it looked like Hamlin was going to get in the Championship 4 after grabbing 19 stage points and a stage win, his chances backfired as he slammed the wall with under 45 laps to go after contact from Chase Elliott, and did not make it to the final round as a result. Hamlin started the 2018 season with a third-place finish at the 2018 Daytona 500. Despite being winless throughout the regular season, he made the playoffs by staying consistent with seven top-fives and 14 top-10s. Hamlin was eliminated in the Round of 16 after finishing out of the top-10 at Las Vegas, Richmond, and the Charlotte Roval. He wound up 11th in the final point standings, his first time outside the top ten since the year he missed four races due to injury (2013) and winless for the first time in his career, snapping a 12-season streak of winning at least one race dating back to his first full-time rookie year (2006) when he swept both Pocono races to when he won the July New Hampshire race along with his second Southern 500 (2017). Hamlin's long time rival, Jimmie Johnson, also did not secure a win in the 2018 season. Hamlin started the 2019 season by breaking a 47-race winless streak with his second Daytona 500 win, first Cup Series win for new crew chief Chris Gabehart, along with dedicating the victory to the late J. D. Gibbs. He scored his second win of the season at Texas. Hamlin is the only son of Dennis Hamlin and Mary Lou Clark. Hamlin and his girlfriend Jordan Fish have two daughters together. Taylor James Hamlin was born on January 20, 2013. Just before the start of the 2017 season at the Daytona 500, it was announced that the couple were expecting their second child. Molly Gold Hamlin was born on August 15, 2017. In 2016, Hamlin was a Fox NASCAR guest analyst for the Xfinity Series race at Talladega. A year later, he returned to Fox for the Cup drivers-only broadcast of the Xfinity race at Pocono, working in the Hollywood Hotel studio alongside Danica Patrick. Hamlin, along with his Toyota teammates, recorded video clips on how to drive a lap at all of the NASCAR tracks on the 2016 circuit to appear on the upcoming video game NASCAR Heat Evolution. He is also featured as one of eight playable drivers on the EA Sports NASCAR Racing arcade game, the only rookie to be featured in the game. † - Qualified but replaced by Sam Hornish Jr.
^ "Rockwell Automation Racing Driver Denny Hamlin". Rockwell Automation. Archived from the original on July 18, 2011. Retrieved June 23, 2011. Born in Tampa, Florida, Hamlin spent a majority of his childhood in Chesterfield, Virginia. Hamlin was the youngest of six children. Making his first start in a go-kart at age 7, Hamlin won his first race and has been winning ever since. He quickly moved through the local tracks of Richmond, Virginia and conquered the Mini Stocks, Grand Stocks and Late Model Stock Cars before being noticed by Joe Gibbs Racing. Hamlin currently lives in Cornelius, NC and, when he is not racing, enjoys online gaming, golf and spending time with friends. ^ "Profile". DennyHamlin.com. Archived from the original on March 12, 2013. ^ First Turn: Best Rookie Seasons - No. 1: Denny Hamlin, youtube.com; accessed August 22, 2017. ^ McCubbin, Ashley (March 27, 2010). "NASCAR: Denny Hamlin To Have Surgery Monday on Left Knee". Bleacher Report. Retrieved 2019-02-18. ^ "Ford out as crew chief for Hamlin, No. 11". NASCAR.com. December 6, 2011. ^ "Hamlin wins Phoenix Sprint Cup race". FOX Sports. March 4, 2012. Retrieved March 4, 2012. ^ Bruce, Kenny (March 25, 2013). "Hamlin suffers L1 compression fracture". NASCAR. Retrieved March 25, 2013. ^ Bruce, Kenny (May 5, 2013). "Hamlin's early Talladega exit goes according to plan". NASCAR. Retrieved May 5, 2013. ^ Reed, Steve (May 23, 2013). "Hamlin takes Coca-Cola 600 pole with record lap". Yahoo! Sports. Retrieved May 23, 2013. ^ "Hamlin spins, causing multicar crash". NASCAR. July 7, 2013. Retrieved July 14, 2013. ^ Hembree, Mike (February 15, 2014). "Denny Hamlin wins Sprint Unlimited on wild night". USA Today. Retrieved February 15, 2014. ^ Spencer, Reid (February 20, 2014). "KENSETH, HAMLIN PREVAIL IN THRILLING DUEL FINISHES". NASCAR. Retrieved February 21, 2014. ^ Bromberg, Nick (March 23, 2014). "Denny Hamlin to miss race at Auto Club, Sam Hornish Jr. to fill in". Yahoo! Sports. Retrieved March 23, 2014. ^ Owens, Jeff (May 4, 2014). "Denny Hamlin wins crash-marred race at Talladega". Sporting News. Retrieved May 5, 2014. ^ Ryan, Nate (April 20, 2015). "Ryan: Erik Jones' Sprint Cup 'debut' will be remembered even without the official recognition". NBC Sports. Retrieved April 20, 2015. ^ Holly Cain (February 21, 2016). "Denny Hamlin wins thrilling Daytona 500". ^ "Tempers flare after Elliott, Hamlin contact in Martinsville". Official Site Of NASCAR. Retrieved November 17, 2017. ^ Spencer, Reid (February 17, 2019). "Denny Hamlin wins 61st annual Daytona 500 as JGR finishes 1-2-3". NASCAR.com. NASCAR Digital Media, LLC. Retrieved February 19, 2019. ^ Spencer, Lee (March 31, 2019). "Denny Hamlin rallies from pair of penalties to win at Texas Motor Speedway". NASCAR.com. NASCAR Digital Media, LLC. Retrieved April 1, 2019. ^ "Denny Hamlin, Jordan Fish welcome first child". NASCAR. January 21, 2013. Retrieved January 23, 2013. ^ "Denny Hamlin, Jordan Fish announce birth of second child". NASCAR.com. NASCAR Digital Media, LLC. August 16, 2017. Retrieved October 29, 2017. 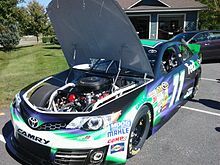 Wikimedia Commons has media related to Denny Hamlin.